Announced in August 2014, Toy Stories: War Chest is a tower-defense/action game that pits armies of toys against one another for control of the toy box. Today Ubisoft announced that the game will be released in both a standard edition, with a mix of classic toy "types" like Kaiser Wilhelm and his First World War Germans, and the Black Dragon Army of the evil Dark Lord, as well as a "Hall of Fame" version with more familiar, and more "real," teams of toys. Along with the Kaiser and the Dark Lord, the standard release of Toy Soldiers: War Chest will also include Phantom and her Ghost Company, a team of guerrilla warriors from the future, and Starbright, the ever-so-cheery leader of Buddy Bears, Ponies, and Pixies. Those who opt for the Hall of Fame edition, however, will also get to play with some officially licensed toys, too. First on that list is He-Man and his giant green cat—the imaginatively named Battle Cat—backed up by Swift Wind and an army of Man-At-Arms (Men-At-Arms?) and Orkos. GI Joe is coming to the party too, although all we get to see of the Joes is Duke, who strides onto the field at the very end, with a big grin and the worst "Yo Joe!" I've ever heard. Ubisoft said that two more licensed armies to be included with the Hall of Fame edition will be announced later, and although I dig the idea of getting licensed toys into Toy Soldiers, I think it's unfortunate that Ubisoft is choosing to limit them to a special, and presumably more expensive, edition. I mean, is anyone really going to say, "I want the game about fighting toys, but not with the real-life toys that were actually about fighting?" I don't think so. 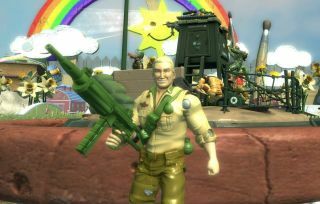 In any event, both editions of Toy Soldiers: War Chest are slated to come out this summer. Find out more at toysoldiers.ubi.com.